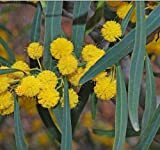 Acacia saligna growing tree or shrub of the genus Acacia also known as Port Jackson willow, Acacia saligna perennial evergreen plant used as ornamental plant and also as bonsai, can grow in subtropical, mediterranean, desert or temperate climate and growing in hardiness zone 8-11. Leaves color green in linear shape, the branch are weeping. Flower color yellow in pompom shape. Pods when young have bad smell. 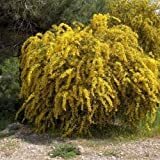 Acacia Saligna" Golden Wreath Wattle Tree - Blue Leaf Wattle (35 Seeds)"050"